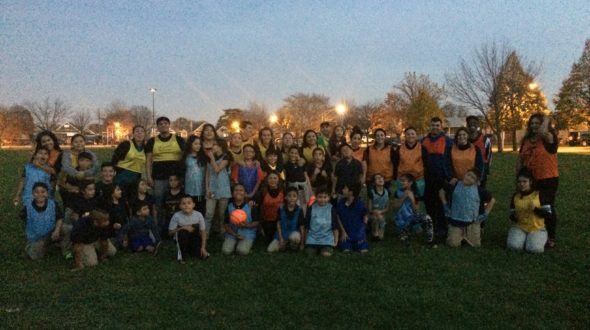 Coach Cecilia shares highlights from her parent/player scrimmages at Stevenson Elementary! The primary goal at Urban Initiatives is to empower Chicago’s youth to become agents of community change through academic success, healthy living, and leadership development. Family involvement within the Work to Play program is very important at Urban Initiatives. During the course of the last couple weeks, Stevenson Elementary held its first Parent vs. Player game day; which resulted in a memorable event for both kids and their parents. 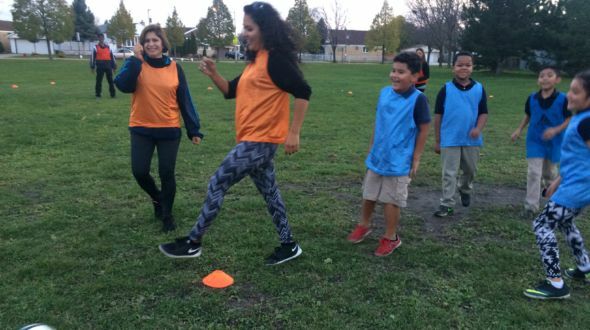 Not only did this event help parents meet coaches and teammates, but also they were able to take the field and show off their sweet soccer skills. Before games took place parents were required to sign-in and register for a raffle that would be held after the game. Students were then instructed to stand by their parents to create teams. Soon as pinnies were given orange/yellow for parents and blue for kids, the tone was set for the rest of the day and it was evident there was going to be some serious competition. On the opposite field, the game began the same way by greeting each other. Words were exchanged but it was the parent’s who started the chanting “you guys are going down!” the expression on the kids faces were priceless. Jonathan’s dad was eager to be the goalie, which gave parents an advantage of winning! After, thirty-minutes within the game rotations took place; for the second game it was parent’s vs parent’s and kid’s vs kid’s. This was another highlight of the event! The parents were ready to play against each other. At first the kids were side tracked and amused that their parents were playing against each other. Brandon’s grandfather mentioned at his arrival he was not good at soccer but he was dominating on the field! I’m sure he was just being modest and Brandon was happily cheering his grandpa on from the opposite field. Parent vs Player game day at Stevenson was a huge success! The day ended by taking awesome group photos and a raffle in appreciation for the parent’s support. This event would not have been great if it wasn’t for parental involvement in the Work to Program. Both parent’s and student’s are looking forward to another game! Again, thanks to all the parent’s unconditional support because none could have happened without you.